K-1 Fighter Kang Bok-Gu (Rain) is a man who is dynamic in nature and grew up in a foster home. He falls in love with a woman whom he should not love. It was because of the woman, his emotionally-wounded brother fell off from the rooftop and became a human vegetable. So, his love is forbidden and inevitably tragic. The woman is Cha Eun-Seok (Shin Min-A) who is a TV talent and movie actress. It was not that she jilted his brother on purpose, but upon a basis of misunderstanding, his hatred toward Cha Eun-Seok grows more and more burning. Binero Feb 19 2018 2:43 pm I‘m in episode 9 and it’s sometimes still confusing. The script writing is messy itself but what kinda ruins it is the cutting and directing. And the camera angles are also really weird. At one point the girl suddenly looks as if she is being abandoned with flashbacks to some entirely unrelated scene and in the next scene Eun seok and Bokgu are smiling together and having fun. So weird. The relationship between Bokgu and his pity girlfriend is also so weird. On the one hand he is supposed to be the (debatable) nice guy who wants to marry her because he ows her or something. And on the other hand he dandles around with his brother‘s ex. Even though he fakes it. Probably. Who knows! He has the facial expressions of a lobster most of the time and suddenly he is all goofy. The plot tells me that it‘s fake but then he never shows if he means to make her fall in love with him or if he really feels something for her (which is also written in the plot outline). There never really was a time where I got the feeling that he actually did fall in love with her. So I don’t get why he treats his pity girlfriend like crap. And then the scene in which he asked Mingu if he was doing the right thing... what do you mean? Making her fall in love with you so you can hurt her? Wanting to kill her? Starting a relationship with her? WHAT THE HELL ARE YOUR INTENTIONS? I just don’t get it. And Cha Eun Seok.. why do girls in dramas need to be so damn helpless and sissy all the time? She always needs to be helped with everything. She hits a boxing bag, it repells and hits her and what happens? She nearly fainted and lay on the floor until Bokgu looked after her. Or in the first few episodes. She left the hotel for a night walk and everyone starts a search party to bring her back. And I hate the parents plot. But that’s kind of standard of korean drama so I shouldn’t go there. Aya Jun 16 2016 6:17 am I have always put this drama in the top 5 of the best dramas I've ever watched. I admit I've watched it a long time ago but I doesn't really matter. I came to see the comments on this page and I'm actually surprise about them. The moment a drama doesn't portrait someone compassionate but who does actual hurtful things the drama doesn't become worthy of watching ? It's the actual opposite to me, I enjoyed this drama because I felt like it depicted the agony of someone initialy unstable that had his miserable life made even more pitiful. Kang Bokgu's character is like trapped in the past, only his body has grown up and I even found him childish and innocent at times. That's why unlike in common romantic drama he sticks to his plan of revenge even though he begins to have feelings for her. When he brutalizes Cha Eun Seok he's punishing himself for having those feelings despite hating her for being responsible for his brother's accident. I'll always have a good memory of this drama and I wish more unique ones would be produced like this one. adelini Feb 21 2016 12:48 pm why his love is forbidden? MitchG Jan 05 2016 12:49 am I hung in there for the first 2 episodes and then bailed out. 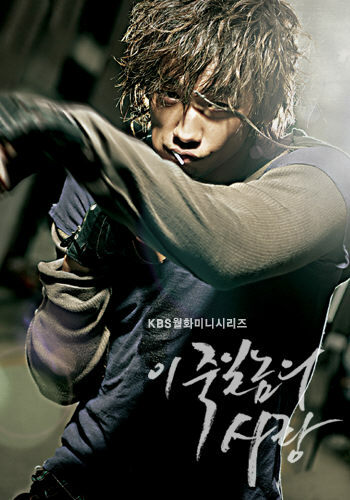 While I liked Shin Min-A's character, Rain's character was shallow to the point of just not being at all interesting. I'm not saying that Rain wasn't doing a good job of acting... I'm saying that the story's lead character was just not interesting to me. What the heck... I gave it a shot. But, I'm not going to risk wasting another 14 hours. Rot May 01 2015 6:48 am 35 mins into ep 1.. and i already hate it.. the characters are trash and the camera work is really one of the worst i have ever seen. Lee Dec 16 2014 3:23 pm I liked it up to about episode 10. Then BokGu acts like a jerk toward Cha Eun Seok in episodes 10-15. Not only a jerk, but machismo jerk who seems to have the emotional maturity of a 10 year old kid. At which point, it seemed to me that she was better off without him. I no longer liked or sympathized with the guy, which is a big negative since he's the main lead. Also, one significant point, for me, was that when he realized that he had been badly mistaken about Cha Eun Seok, he apologizes to her while she's sleeping. Now, to me, that's not an apology. I thought he would apologize again later when she was awake, but he never did. I realize this was fiction, but my advise to the Bok Gu character is attend some anger management classes and grow up (as a human being). In sum, a very uneven drama that hits some fairly sour notes. lovekd Nov 27 2014 12:54 pm This drama had the worst cameraman and director. The "emotional" scenes didn't capture any emotion because of the camera angles, it looks like it was done by 5 year-old kid. Please don't waste your time watching this drama. Imelda Valle Nov 04 2014 7:38 am It's the best Korean drama I ever watched. Rain acting at Full House is so light and I loved it but for this it's heavy and best acting for Rain.. great acting also for Rang and Min-Ah. I am following the My Lovable Girl... a very nice drama too. narges Apr 14 2013 7:09 am i haved watched this drama several times . it is one of the lovlier and sadnesser korean drama. i love rain & shin min ah. i suggest to every one to watch it. John Mar 22 2013 12:40 pm Sorry, but I can't endorse this drama. Although Shin Min-A's character is very sympathetic and her acting is top notch as usual the character played by Rain has no redeeming qualities and in the end I was hoping he'd get hit by a truck before he could do more damage to everyone -- everyone -- around him. He is so self absorbed and negative while occasionally he does the right thing in the end he is just a very self absorbed and self centered jerk (as he calls himself) who ruins the lives of a large number of people (if you think about it it includes, friends, family, lover, acquaintances, and he even lets his brother down)... pretty disappointing and a total waste of time... I did not feel sorry for Rain's character at all... I just wanted someone to shoot him or run him over with a "big" truck. TAMARAXXE Mar 19 2013 6:12 am A work of art and one of the most brilliant and lovely dramas I have ever seen. I have watched it several times and will watch it many more. Rain is the hottest man alive.